I watched a man stand on a Wii Balance Board to play a game of Super Monkey Ball last week. And I misheard a key detail for an awkward half-minute. Super Monkey Ball Step and Roll for Wii is coming out from Sega early 2010 and controls exactly as you would expect a Balance Board Monkey Ball game to. 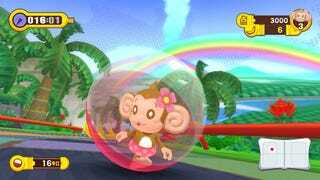 The Sega rep who demonstrated the game for me in New York tried some standard Monkey Ball stages — you know, monkey in translucent ball is made to roll through stage, collecting bananas, en route to a goal. Instead of using an analog stick to do this, the Sega man standing on the Balance Board leaned his body weight forward, back, left or right. All well and good, but what if you don't want to play with the Balance Board? You will be able to play the game with a Wii Remote and Nunchuk, I was told. But the stages will be changed. I thought the Sega man told me that the stages suddenly would get Popsicles added in them. This got my mind racing about the diet of monkeys in Monkey Ball. They like bananas, but Popsicles are a threat? I asked. What's up with Popsicles? Why should the monkey worry about them? Oh. Did you say obstacles? Yes, the Sega man said obstacles. And that is how Super Monkey Ball Step And Roll will accommodate those who use hand controls, which, I guess would otherwise make the game easier. The game will also have mini-games, a series staple. I watched a simple race, which had monkeys rolling around an oval track. Everything I saw looked like classic Monkey Ball design, just with a new control scheme. Not a Popsicle to be found anywhere.